PJ22. 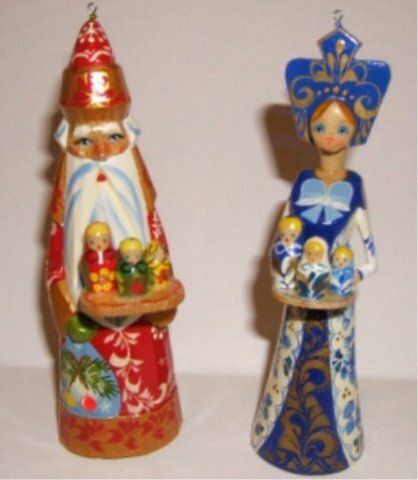 Christmas Couple Ornaments 6"
This pair of Russian ornaments represents Father Frost and his daughter the Snow Maiden, each carrying a tray of nesting dolls. Marked on the bottom are the words “сергиев посад” which translates to town of Sergiev Posad, a common center for Russian dolls. This particular pair of ornaments is very special and rare and professionally hand painted with great detail.